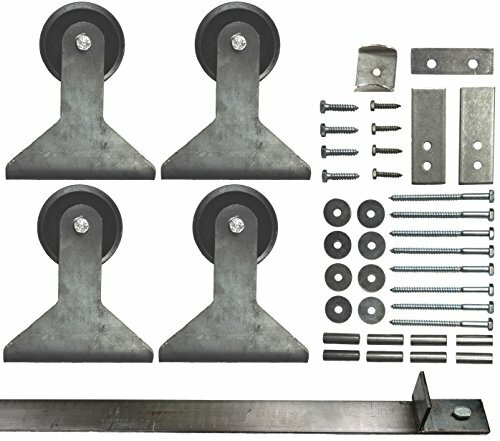 This Double Sliding Barn Door top mount style hardware kit is perfect for anyone looking to install a DIY barn door. The barn door kit includes everything you need besides the tools to install it. The parts included are as follows: Four Top Mount hangers with 3" cast iron wheel - Hanger Length is 6-1/4" total and 3-5/8" from wheel groove to end of hanger. The Hanger is 5" wide by 1-1/4" deep by 3/16" thick at the base and 1.5" wide by 3/16" thick where the wheel attaches; 8 foot length track (overall length is 8'4" to accommodate end bumpers) of 1.5" wide x 3/16" thick steel track; 1-5/8" length spacers that hold the track off the wall; Washers that go between the spacers and the wall; 5/16" x 4.5" Lag bolts to attach the track to the wall; 5/16" x 1-1/2" lag bolts to attach the hangers to the door; Two 2" x 2" angle iron end stops; 2 safety anti-jump clips to prevent possible derailment and bolts to attach; Floor mounted door guide fits doors up to 1-7/8" width or can be used with a 1/8" mortise or kerf cut on the bottom of the door (for wider door guides, please contact us). *Track will come in two pieces with splice kit included **The track is not predrilled to allow you to drill holes at the necessary locations. ***Hardware works with doors of 1-1/4" to 2-1/4" thickness. Installation instructions will be included and other helpful hints can be found online. If you have any questions about this product by Mapp Caster, contact us by completing and submitting the form below. If you are looking for a specif part number, please include it with your message.